One of our favorite ways to encourage character growth in our children, was to use character charts to measure their progress. This kept us watching for the efforts they were making, and it also reminded them to keep trying to show Godly character through out the day. One of our favorite ways to encourage character growth in our children, was to use character charts to measure their progress. This kept us watching for the efforts they were making, and it also reminded them to keep trying to show Godly character through out the day. With that in mind, we designed the Excellence in Character Chart, and a Growth in Character Chart. We used these charts to have character contests and character celebrations. With most of the kids, when they got to be about 12, they didn’t get as excited about it all as when they were young. At that point, a younger sibling was usually old enough to understand and be added in. Obviously, you don’t have to use the charts like we do. It will depend on how many kids you have, their ages, and how you want to use them with your family. I am just presenting this so you know how we have used them in our home. We choose a time frame (1 – 2 weeks), and let the kids know when the character contest begins, and when it will end. During that time we would watch for the kids to show good character, and give them a mark on the chart for the trait they displayed. For example, if one of them picked up toys without being told, we would give them a plus (tally mark) under their name for initiative on the Excellence in Character Chart. When the contest time ended, we had a character celebration. 1. We chose a trait out of the bowl, and the child with the most marks for that trait was the winner. We awarded the him/her with one of our character ribbons, and a prize from the prize bag. (toys from the Dollar Store, packs of gum, candy bars) We all clapped and got excited for the winner. 2. After the winner announcement was done, we looked at the Excellence chart to see who could fill in any squares on their growth chart. For every five marks they got for any trait, they got to fit in a square on their Growth in Character Chart for that trait. This enabled us to recognize them for the progress they had made during the week, even though they may not have been the winner. 3. After this time of recognizing the progress that the kids had made, we had a special treat like ice cream or cookies. Even though the kids started to lose their excitement about winning as they got a bit older, we still wanted them to keep a focus on character, and be involved. Sometimes I would pair the older ones up with the younger ones, and they’d encourage their team mate during the contest. Another thing I did was have the teens help me watch for good character in the younger ones. I started this when I noticed one of the teens was VERY good at seeing the bad in his siblings. Often he could be heard saying things like, “Awww – you’re not obeying!”, or “You’re having a bad attitude!”. I wanted to turn the negativity into positive comments instead. So I told the teen that I needed his help with watching for good character in the kids, and asked him to give them a tally mark on the chart whenever he saw them showing good character. This turned things around for him and the siblings! He started to notice the good, and they were much more encouraged to hear him say, “Wow! You just showed initiative (or some other trait)! I’m going to give you a plus on the character chart.” To me, it was very exciting. I love hearing my older kids encouraging their younger siblings to do what is right! 1. It kept my husband and I focused on the positive behavior. It is so easy to see the wrong things our kids do and get after them for those things constantly. Yet, we forget to look for right behavior and good character and praise them for it. Using these charts caused me to be on the look out for any signs of effort to practice good character. As a result, I was much aware when they did right things, and I encouraged them more often about the right behavior. 2. It kept us focused on what was important. Sometimes we forget that Godly character is more important than physical accomplishments (like in sports), musical abilities, or getting good grades. As a result, we convey the wrong priorities to our kids, and fail to teach them what really matters. My husband and I felt very strongly that training our kids in good character was one of our top priorities and goals. 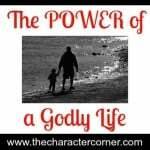 We wanted the kids to know that Godly character pleased the Lord, and was important. 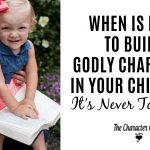 Using the charts helped us to remember to look for good character in our kids, and to praise them when they showed it, letting them know we were pleased with their behavior and so was God. 3. It kept the idea of Godly character before the kids all through the day. All it took was us “catching” one child showing good character, and giving them a mark on their chart. Other kids would then start thinking about how they could show good character too. Choosing to do things that show good character becomes a habit over time, and then develops into character. 1. They MAY be doing it for the wrong reason. However, they are purposefully choosing to do something that is right. In reality that’s what character is. Doing what’s right whether we feel like it or not, because it’s right. 2. God uses rewards to motivate us to do right. In the Bible we are promised that we can get stars in our crowns. So why not encourage our kids to do what pleases the Lord by using small rewards, such as verbal praise, marks on a chart, or little prizes in a character celebration. GET A FREE DOWNLOAD of the Excellence in Character Chart and Growth in Character Chart when you subscribe to our newsletter. 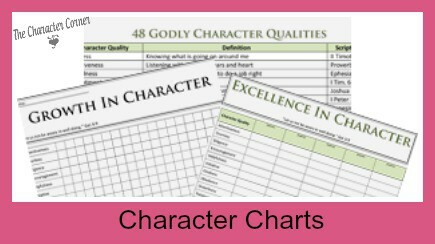 As an added bonus we have also included the 48 Godly Character Trait Chart. This chart lists the definition of the traits, and a Bible verse that relates. It’s a great resource to put on your fridg for quick reference. 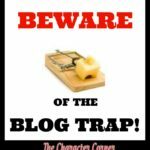 Beware of the Blog Trap! I love your idea of the character charts and randomly drawing a trait at scheduled intervals. This sounds perfect for my 3 kids! My husband and I tend to focus on the negative and not the positive so I think this will be a big help in our family. I have become a subscriber, but haven’t been able to figure out how to download them. Can you please help me figure it out? Thank you! Hi, I subscribed to your blog, but I never got an email to download the character chart. I’m sorry you didn’t get the charts. I’m looking into it, but will send you an email with them attached. Thanks! I really enjoyed reading this post. It sounds perfect for my 3 kids! My husband and I tend to focus on the negative instead of the positive and this would be a great tool for my family. I have subscribed to your newsletter, but I haven’t been able to download the character chart. Can you help me figure out how to download these resources please? Thank you. Hi Jackie! Yes – that’s one of the reasons we made the character charts. 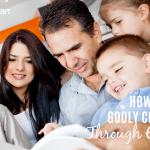 My husband and I tended to see (and comment) on the negative behavior in the kids, while overlooking the good, and the efforts they were making. I will email you, and attach the character charts for you to download. I love this post, and it was explained very well and simply. I’ve read about your charts before but this made me feel like I could execute the use of them with our kids. I also like your explanation of how its an acceptable thing to use rewards such as these in training godly character. Thank you, Kathie, for all of your wonderful materials, and for always reminding us to seek God and His kingdom FIRST!! You are a blessing to me! Thanks Jen! So glad the post helped explain how to use them, and made you feel capable. 🙂 Thank you for your encouraging words too! My family and I are going to start foster caring children within the next few weeks. This sounds like something that will work great in our household. I can’t wait to get started. Thank you for sharing this. How exciting for you Tara! Hope all goes well, and that the charts prove to be helpful. Hey, This is really great. I signed up for your newsletter but wasn’t able to receive the chart. I notice a comment that someone else had this same problem. Could you send it to me? Sorry ou weren’t able to get the character charts! I will email you and attach them for you to download. Hello Kathie! I signed up for the download of the character chart but havent received anything. Would you be able to send a copy to me, please? Thank you so much! I just found this site yesterday and want to read it all…so mich good wisdom and suggestions! HI Sara, and welcome!! I will email you with the charts attached, so you can download them. Glad you are enjoying the site and posts! Hi Jaime! I’m so glad you found my page. Yes – I relate to the challenge on focusing on the positive, rather than just seeing the negative. You and your kids will enjoy using the character charts. I will email you and attach them for you to download! Thank you for all the encouragement we received from all your work and deep understanding of each child’s growth in godly character, we didn’t even hope to find so many wisdom and so much hope in just one place only on the internet. Warmest wishes from Romania! Unfortunately we didn’t received the Character Chart and Growth in Character Chart either. I sent you an email with the character charts attached. Sorry the link didn’t work for you! I began receiving your emails a week or so ago and I have already gleaned so much from your experiences! Thank you so much for sharing your wisdom. I too would like to use your character charts but the link isn’t working for me. Is there another way I could access it? Thank you in advance! HI Whitney! I’m so glad that you have been enjoying the site & emails so far. I hope they will continue to encourage you. I will email you with the character charts. Hi , The blog was really an eye opener – Thank you. I will definitely try these ideas on my kid. I would like to have the character charts, could you please send me a copy of the same t my email address ? Hi Sowmya! I sent you an email with the charts for you to download. Just sent you an email with them, Melissa! Hi! I subscribed but have not received an email with the charts. How do I get a copy? Thanks so much! Hi Hannah! Sorry you never got the charts. I emailed you with them attached.